As one of the most popular hikes in America, BREAKNECK RIDGE is a must-do. A 3/4-mile scramble rewards you with breathtaking views and a real sense of accomplishment. Who needs a gym membership with nature's playground just a quick train stop away up Metro North? But don't let this ridge's popularity fool you -- this hike is not for the faint of heart. If you start at Breakneck Ridge, you will be embarking on the most strenuous hike in the Hudson Highlands and entering a 7,400-acre state park. People get lost and injured regularly. You should always bring a good map and compass with you--and know how to use them! If you're not completely confident exploring alone or want to get the inside scoop on the flora, fauna, and landscape you're seeing, bring a knowledgeable guide with you! There are several 3-5-hour loop options, including the technical, but beautiful Undercliff Trail, a streamside path (good for dogs on hot days! ), and the chance to explore the Cornish Estate ruins in the woods. To spend the whole day outside, seeing beautiful landscapes, flowers, and creatures you never would have otherwise, ask about a Full-day through hike from BREAKNECK TO BEACON. You'll get (most of) your workout in early scrambling up Breakneck Ridge, and enjoy the joys and challenges that come with it. After our snack break at the top, we'll hike the ridge line along a less-traveled route toward the Beacon Fire Tower. There is another scramble before we get there, but the series of delightfully secluded overlooks are well worth the effort. We'll take lunch at the South Mt. Beacon summit, were you can walk up the newly-restored fire tower for the best 360 views in the region. Take a moment to appreciate the rolling hills of green between you and the distant New York City skyline--and how far you've already hiked! There are many route options from here, including the locally popular Casino Site overlook, a loop around the Beacon Reservoir, several less-traveled (and unmarked) routes, and a beautiful ridgeline loop along FISHKILL RIDGE before we make a stream-side descent complete with a small rock-hop section and waterfalls. The weather conditions, ripeness of the wild blueberries, raspberries, and blackberries, and interests of the group will guide our route for the descent. Do you prefer the rarely-traveled routes? 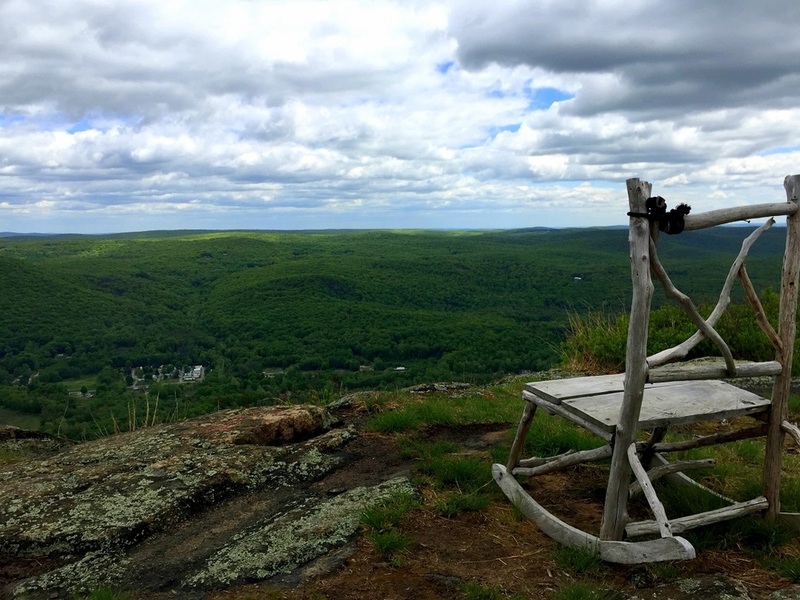 Ask about hiking FISHKILL RIDGE or making a day of it from BEACON TO COLD SPRING. Your guide Kali Bird has worked as a Breakneck Ridge Trail Steward with the New York-New Jersey Trail Conference for two seasons, helping hikers plan the best routes for their upcoming adventure, and assisting when everything does not go according to plan. She knows the ridge's routes, wildlife, and best kept secrets like they're in her backyard--because they are.